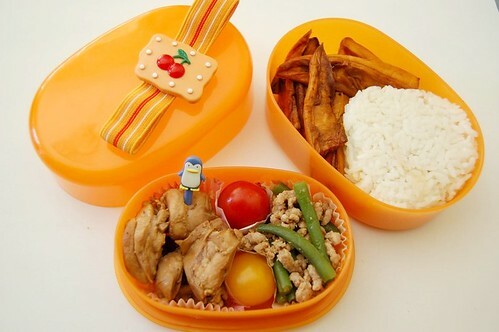 I love the penguin pick in this bento. I bought it from J-List in a pack of sea-creature food picks, but I think the penguin is my favourite. Inside this bento is a mixture of different recipes I was trying out for the first time. I think the sweet potato was a recipe from Wagamama, and included a honey and lime juice dressing. I’m not big on sweet potato, to be honest, and this one didn’t really sway me to the cause. This bento picture was actually taken over two years ago, and as you can see, I’d still not really perfected the art of packing onigiri… Ah well. The orange bento box is from Daiso, and even though it’s one of the cheapest ones around, it’s still my favourite because it’s such a nifty oval shape. The front tier contains soy-balsamic chicken and spicy green beans, both adapted from Harumi’s Japanese Cooking – both of her English cookery books are great, although I prefer the second one! If making for the bento, trim your green beans (or French, or fine…whatever you call them!) into halves or even thirds, so they can be picked up easily by chopsticks. Boil for about four minutes, then drain and refresh quickly in very cold water. This is to retain their colour. Drain again, and shake off excess water. Heat the garlic oil in the pan and add the pork, stirring to break up. Now add the chilli pepper and stir well to coat, then add the soy sauce and sugar. Mix well, ensuring the sugar has dissolved, and then serve the beans with the mince on top. Mix the soy sauce, balsamic vinegar and sugar in a pan, then simmer. Allow to cook for several minutes, reducing the sauce until it’s thick and glossy. Now wash and dry your chicken thighs, and place them in a hot pan with the oil, and allow to brown on one side. Turn them over and pour over the sauce, then cover and cook for five minutes, taking care not to let the sauce burn over too high a heat. Remove the chicken and test it’s cooked by slicing a piece in half. Return to the heat if it needs longer. For a bento, allow to cool before slicing and dressing with some extra sauce. You will need about one or two chicken thighs, depending on size, per person for a bento lunch. These recipes originally appeared in 501 Bento Box Lunches, published by Graffito Books.